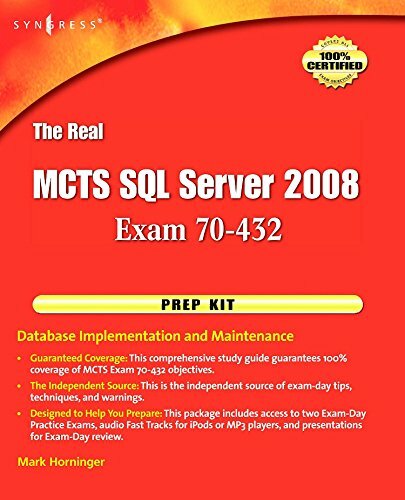 The Real MCTS SQL Server 2008 Exam 70-432 Prep Kit prepares readers for the Microsoft Certified Technology Specialist exam: SQL Server 2008, Implementation and Maintenance. This is The 'Real' Microsoft Exam Prep Kit, and provides the reader with independent and unbiased exam tips and warnings everything they need to know to ensure certification success. Authored by Mark Horninger, a nationally recognized leader in SQL Server with over 50 Microsoft certifications to his credit; Mark knows what it takes to successfully navigate Microsoft exams. If you have any questions about this product by Syngress, contact us by completing and submitting the form below. If you are looking for a specif part number, please include it with your message.